AUKI, Solomon Islands, May 30 2013 (IPS) - Selina, a resident of a small community in Malaita, the most populous province in the Solomon Islands, watched in horror as a man standing on the road in front of her house tore the clothing off his wife, then beat her and inflicted wounds with a knife. Although the crowd that had gathered at the scene was unwilling to intervene, Selina was not intimidated. Selina pursued the couple alone along the road and took her chance to rescue the woman when the husband walked away for a cigarette. Fleeing through the darkness with the perpetrator in blind pursuit, Selina finally managed to hide the victim in a nearby house before alerting police and medical services. The husband was arrested and remains in police custody. In this Western Pacific country comprising over 900 islands, located northeast of Australia and east of Papua New Guinea, there are tales every day of violence and abuse against women. Entrenched gender inequality has resulted in one of the world’s highest rates of domestic violence, with an estimated 64 percent of women aged 15 to 49 years experiencing violence at the hands of a partner. But in Malaita Province, 100 kilometres east of the capital, Honiara, women are taking action and saving lives. In 2011 the Malaita Council of Women urged the ministry of national unity, peace and reconciliation to offer a domestic violence education programme for local women in this province of approximately 140,000 people. 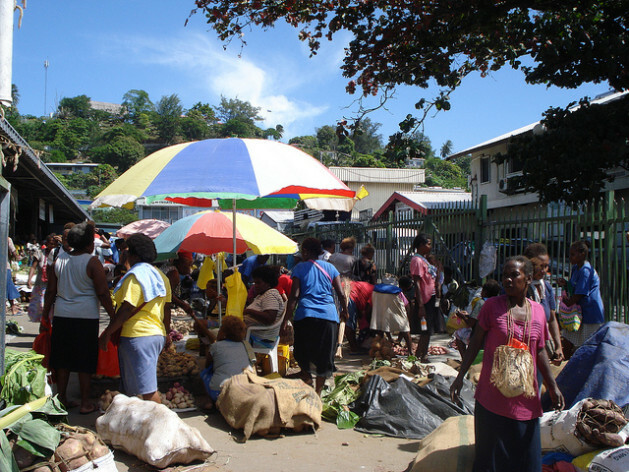 A spokesperson for the Council told IPS that, with 80 percent of the population residing in rural areas with inadequate infrastructure and services, it is vital that women at the grassroots level receive the support and training they need to defend themselves, especially since the only women’s refuge in the country, the Christian Care Centre, is located miles away, in Honiara. The education programme has generated strategies that include intervening when witnessing family violence, promptly alerting police, assisting the victim to safety and working in partnership with law enforcement officers to visit affected communities and engage people in dialogue about domestic violence as a crime. Although less than half of the Council’s 500 individual and 30 group members have completed the awareness programme so far, women like Selina have already demonstrated its benefits. Stigmas surrounding victims of gender violence, coupled with fear of punishment by male relatives and “retribution”, have forced female survivors into silence. But Selina’s act of courage earned her much applause and pushed women in the community to call for greater media coverage of such incidents. Advocates say it will take a long time to change the behaviours and attitudes that have allowed this climate of abuse to prevail. In a 2008 family health and safety study, many men referred to gender inequality as a “norm”, while 73 percent of both men and women indicated that violence was acceptable if women failed to live up to “traditional roles” of domestic labour and service within the family. Despite the presence of women in education and formal employment, views that their rightful place is within the domestic sphere remain strong. Women carry the burden of labour intensive work, such as collecting firewood, water and working in food gardens, and remain underrepresented in public decision-making roles, with currently only one female parliamentarian in the country. The most recent independent education survey conducted in 2007 by the Asian South Pacific Bureau of Adult Education revealed massive gender gaps in education: 53.8 percent of female respondents aged 15 to 19 years were not enrolled in school, compared to 37.6 percent of males; female literacy stands at 14 percent, in contrast to 21 percent for males. Domestic violence is now endemic in the country, with the Family Support Centre in Honiara recording up to six cases per day. The government recently introduced national polices on eliminating violence against women and on gender equality and women’s development, both of which promote women’s political, social and economic advancement. The launch of a “zero tolerance” policy on family violence by the police force seven years ago has also supported women’s efforts to see justice. “When someone reports a domestic violence case, we conduct an investigation and the perpetrator is immediately remanded in custody,” a police spokesperson in the main provincial town of Auki told IPS. The policy has fostered a higher degree of trust for the police force, and resulted in many police officers charged with domestic violence losing their jobs. Prior to implementation of the policy, only one domestic violence case was reported in Malaita in 2005, but this rose to 18 cases in 2010 and 12 last year, with the majority involving grievous bodily harm and unlawful wounding. Experts estimate scores of cases go unreported, with victims facing enormous pressure from extended family members, especially in-laws, to remain silent. “We can no longer stand by and say that domestic violence is not our business. We must take action and intervene to stop it happening,” Selina emphasised.